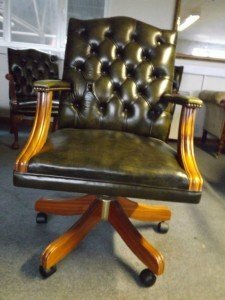 A vintage high back Chesterfield swivel office chair on wood legs and castors, upholstered in dark green leather with button back detailing. 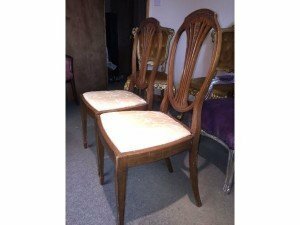 A pair of vintage solid wood carved oval back hall chairs, upholstered to the seat in cream damask satin. 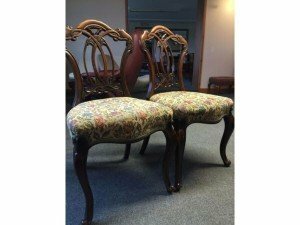 A pair of vintage heavily carved mahogany dining chairs on paw feet, upholstered in floral patterned fabric. 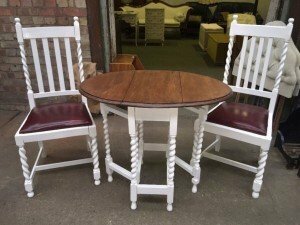 A solid wood circular drop leaf dining table, together with two high back dining chairs, upholstered to the seat in purple leather. 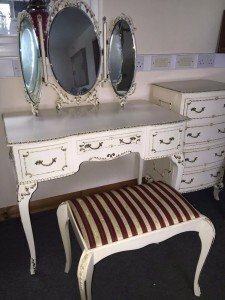 A vintage heavily carved solid wood dressing table and tri folding mirror, together with a matching stool. 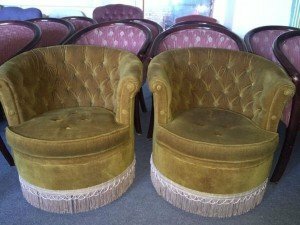 A pair of vintage children’s tub chairs, upholstered in green velour with button back detailing and fringing. 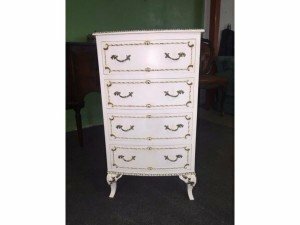 A tall vintage solid wood chest of four drawers, hand painted in white with gold detailing. 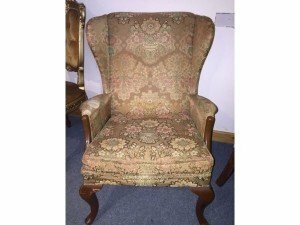 A vintage high back gentleman’s armchair on mahogany legs, upholstered in floral patterned gold fabric. 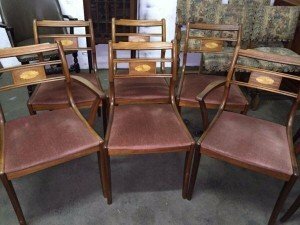 A set of six vintage mahogany low back dining chairs, upholstered to the seat in purple satin. 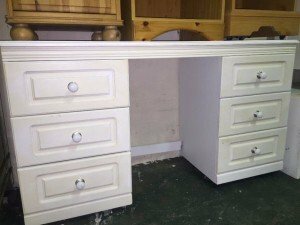 A large solid wood hand painted white desk, having three drawers to either side of the chair area. 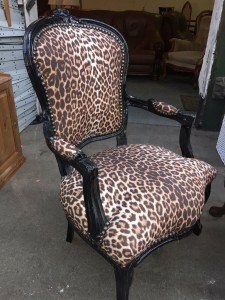 A black painted solid wood hall chair, upholstered to the seat and back rest in leopard print fabric. 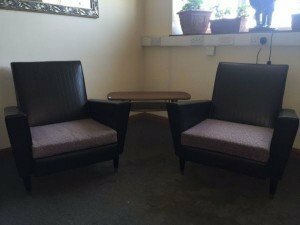 A pair of retro black leather armchairs on wood legs, together with a mahogany side table. 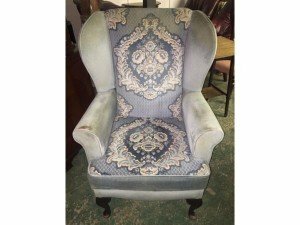 A vintage high back gentleman’s armchair on mahogany legs, upholstered in green velour and damask patterned blue satin. 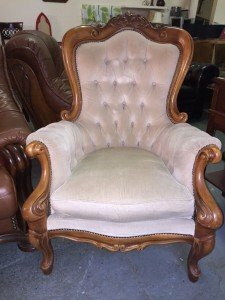 A heavily carved solid wood high back armchair, upholstered in cream velour with button back detailing. 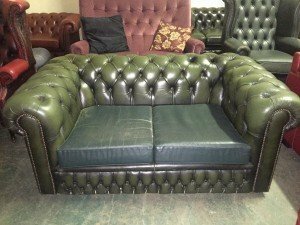 A small two seater Chesterfield sofa on mahogany feet, upholstered in dark green leather. 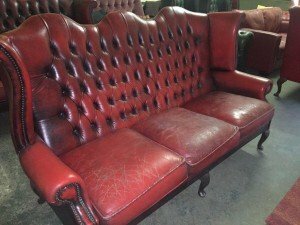 A large three seater high back Chesterfield sofa on mahogany legs, upholstered in ox blood red leather. 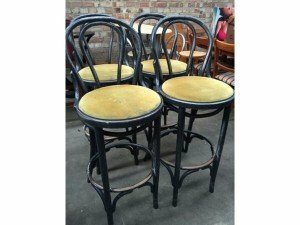 A set of four rounded back solid wood barstools, hand painted in black, upholstered to the seat in mustard velour. 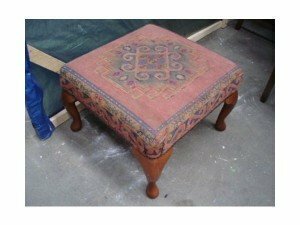 A small Indian style footstool on solid wood legs, upholstered in colourful patterned salmon pink fabric. 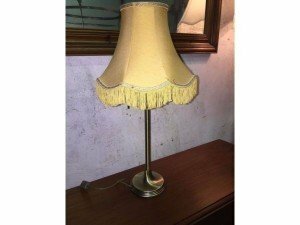 A small vintage brass based table lamp and shade, the yellow shade with tassel detailing all around. 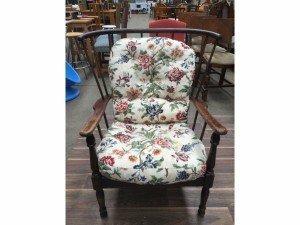 A solid oak vintage high back armchair, the removable cushions upholstered in floral patterned fabric.